This veesatile Duo Board is ideal for use in any meeting room. 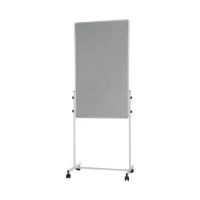 Attach a flipchart pad to the adjustable clamp for an effective flipchart easel, or write directly onto the dry-erase whiteboard surface. On the other side, you can affix posters and notes to the felt noticeboard surface with pins. The solid aluminium frame sits on four castors for great mobility, and they can be locked when not in use to keep the board secure. This board measures 1200 x 790mm.